Jindal, Adani, Vedanta are Big Three who transport coal from Mormugao Port. Over four months, Indian Express tracks three key routes to find a trail of health hazards, environmental damage. Nearly 25 million tonnes of coal — evenly spread across a standard football field, this toxic black mountain will rise almost 3 km into the sky. 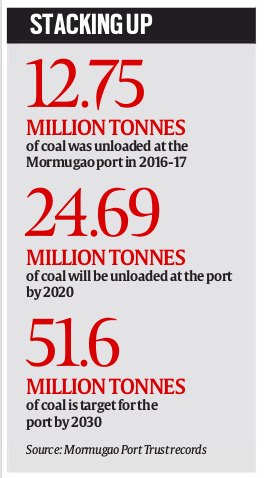 That is the amount that will be unloaded each year at the Mormugao Port Trust by 2020, just three years away. By 2030, official records attest, this is slated to double — up to 51.6 million tonnes each year. In 2016-17, 12.75 million tonnes of coal was unloaded at the port and carried across Goa to power stations and refineries in Karnataka and beyond. By a clutch of importers, the biggest ones being JSW Steel Ltd and the Adani Group. And Vedanta — together they are The Big Three — which currently imports coal for its pig iron plant in Goa, is set to ramp up an additional 1.2 million tons of anthracite, 2.6 million tonnes of coking coal and 2.1 million tonnes of thermal coal for its proposed steel plant in Karnataka’s Bellary. In villages across central Goa, men, women and children speak of how the “devil’s dust” (fine particles of coal) has changed life itself — scarred by soot-covered homes, a lethal cocktail of respiratory ailments and a ruined ecosystem. “We take pride in being conscious of our ecological status, our beaches, our orchards, our cultivation land. Most of our youth have left the state for lack of opportunity and now when these coal corridors are being designed, there is the danger of losing our indigenous identity, too,” says Dolvyn Braganza, 25, a teacher and part-time paddy farmer and vegetable grower in Utorda. Savio Correia, from Vasco, is one of the legal warriors who continues to file applications under the Right to Information Act to fight the port — its coal plans are at the centre of a protracted battle in the courts but more of that later. An investigation has found that the transport of coal is linked not only to the economics of the users but also to the future of the port itself. Indeed, it was the ban on mining and the resultant cutoff in export of iron ore — from 43 million tonnes in 2010-2011 to 11 tonnes in 2014 — that cleared the way for coal to come flooding into Mormugao. 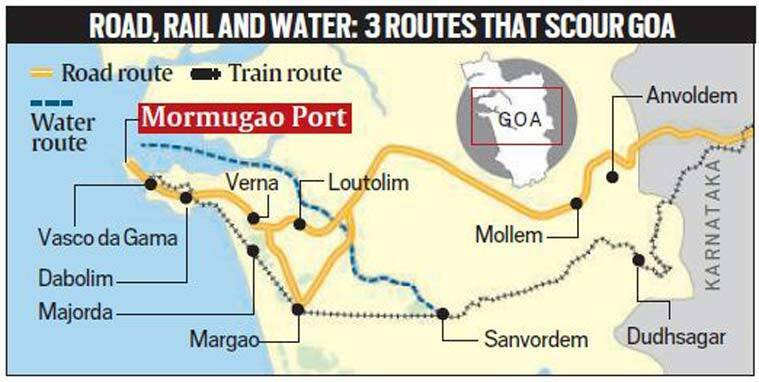 During the iron-ore export days, the port contributed to 35 per cent of the state GDP, according to the Goa government . The coal that lands in Mormugao — mainly from Australia, Indonesia and South Africa — is currently consumed by an estimated 31 corporates.